On New Year’s Eve of the year 2015, after years of looking up to book bloggers and after years of doubting whether or not I had what it takes to become a book blogger myself, I finally made the resolution to start my own book blog in the new year. And lo and behold, on January 12th of 2016, my first post went live! Was it any good? Ehh, it definitely needed some work. But over the years I have been growing and learning and though I still have so much more to learn, I am pretty happy with where I am with this blog today. But even more than that, I am thankful for what I gained by starting: the love and support of the most wonderful and amazing book blogging community. Every single thoughtful comment I received has made me smile. I have been inspired every day by your creativity and intelligence. And I appreciate every single online friendship I have formed with you. So… this would be the perfect time to give something back. And that’s why I am organizing my SECOND BLOGOVERSARY GIVEAWAY! The giveaway will run for two weeks – the winner will be contacted on 27 January 2018. Happy second blogoversary!!!! <3 Hope you blog for many more years to come! A book I would get would probably be an anticipated release of 2018 that comes out within the next few months or a book release from 2017 I never got the chance to purchase. Two blogs you should check out is flaviathebibliophile.com and lostinastory.blog ! Yay, congratulations on two years of blogging!! Oooo I’d probably get the UK paperback edition of The Girl In The Tower…I had an ARC of that book and LOVED it and the UK cover is just so pretty! Also, I feel like a lot of people already read her, but I love Sarah’s Book Shelves! Congrats on hitting 2 years!! What a fun giveaway 🙂 If I won I’d probably go for Scarlet by Marissa Meyer since I just finished Cinder and I don’t want to fall behind haha. happy 2nd blogiversary lindsey!!! my two year one is coming up really soon too!!! your blog is one of my absolutely favourites so i’m very glad you made the decision to start blogging ♥ thanks so much for the giveaway too!! If you don’t mind reading a book blog in Dutch from a fellow Belgian, zwartaafje.be from Liesbet would be great. Happy Blogoversary! Here’s to many more years, cheers! I think I’d like to get Graceling or A Darker Shade of Magic, but there are So. Many. Great. books, it’s hard to choose, isn’t it? As for bloggers, I’d say people should check out Teainthetreetops dot com, because they have reviews and also a podcast, and it’s so nice to actually be able to hear people gushing about the books they’ve read! Congratulations on two years! W00t! Your blog blows me away with its awesomeness. Keep going because you do such a good job! Happy blogoversary, Lindsey!! The years really do fly by, don’t they? One of my favorite bloggers is Cristina over at Girl in the Pages (https://girlinthepages.com/). Her blog is gorgeous and she always posts really deep and thoughtful reviews and analytical posts. 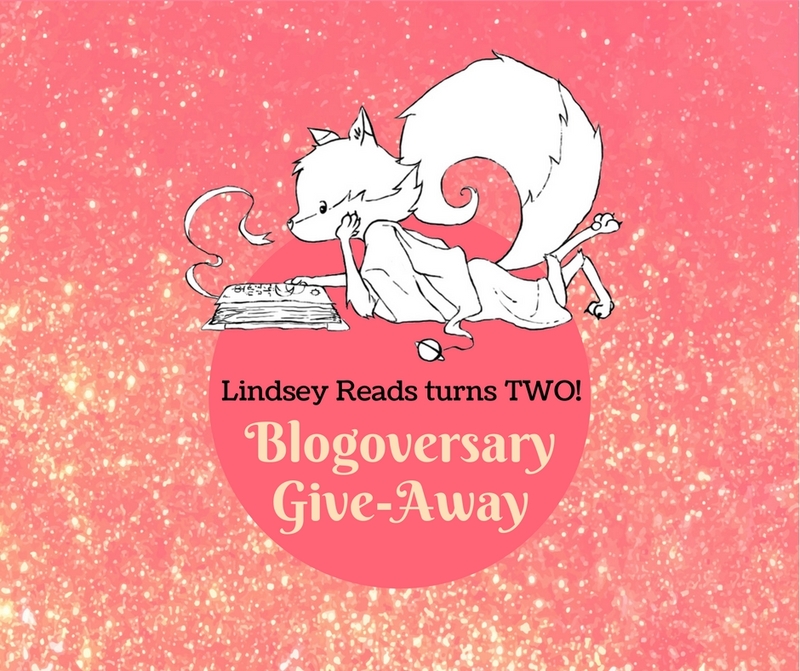 I hope you have a lovely third year of blogging and thanks for the giveaway! Lindsey, congrats on your second blogoversary!!! So happy to have you in this book blogger community and to have gotten to know you via Top Ten Tuesday. 🙂 All the best in 2018; looking forward to what’s to come. I would love to win a copy of The Chalk Man. I just finished reading it and I LOVED it! I definitely need to get a copy for my shelves soon! And hmm, one book blogger I love and think you should definitely visit… have you visited http://oliviascatastrophe.com? Haha, good luck with the giveaway! And I’ll definitely have to check out Olivia’s Catastrophe! Yay, Happy Blogoversary to you! I love your blog so I hope it will be around for many years to come! Congratulations! So exciting for your blog! I don’t know which book I would pick yet, it takes me so much research to commit to a book that I get to keep! Novel Visits and Sarah’s Bookshelves are two blogs that I read often to keep up with new books coming out and I have similar tastes as those ladies! “What book would you love to get if you would win? And what is one book blogger you love and think I should definitely visit?” There are so many books I would like–especially that series of graphic novels about the young woman who is an undergraduate at some UK university! The youtube book vlogger NodinBookinIt is very good and does good reviews of fantasy books and so forth! I remember when your blog turned one, and it feels just like yesterday! Time really flies, doesn’t it? Oh yes, I love The Bookish Libra as well, her blog is amazing! If I won, I would love to get Alice’s Adventures In Wonderland 🙂 And make sure you check Jeann, Aila and Jenna’s blog, Happy Indulgence. It’s amazing! Happy blogiversary, Lindsey!!!!! Happy two years! Amazing work and I’m so pleased to have found your blog in that time.